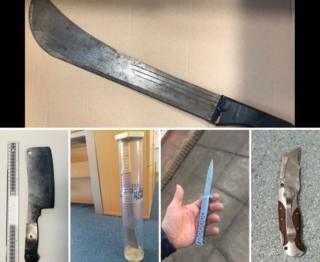 A police crackdown on knife crime in Cardiff has seen more than 100 arrests in six months. Almost £90,000 of drugs and cash have been seized, as well taken 46 weapons taken off the streets, since Operation Spectre began last summer. South Wales Police says knife crime is rare in the Welsh capital - but the force's figures amount to an average of nearly 17 knife crime arrests a month. Most knives were found in woods, parks and bushes, the force said. Among the knives seized by officers were a machete, a meat cleaver and a weapon with a 10-inch blade. The force said the Operation Spectre team often wore plain clothes and used unmarked vehicles to catch criminals unaware. The return of stop and search? Since launching, it has made 101 arrests for knife crime and conducted about 350 "stop searches". South Wales Police Chief Constable Matt Jukes said: "You are at greater risk of being a victim of knife crime if you carry a knife yourself."